Albumasar. De Magnis Conjunctionibus. Augsburg: Erhard Ratdolt, 31 March 1489. Albumasar. Introductorium in Astronomiam. Augsburg: Erhard Ratdolt, 7 February 1489. Apian, Peter. Cosmographiae Introductio. Paris: Gulielmum Cauellat, 1551. 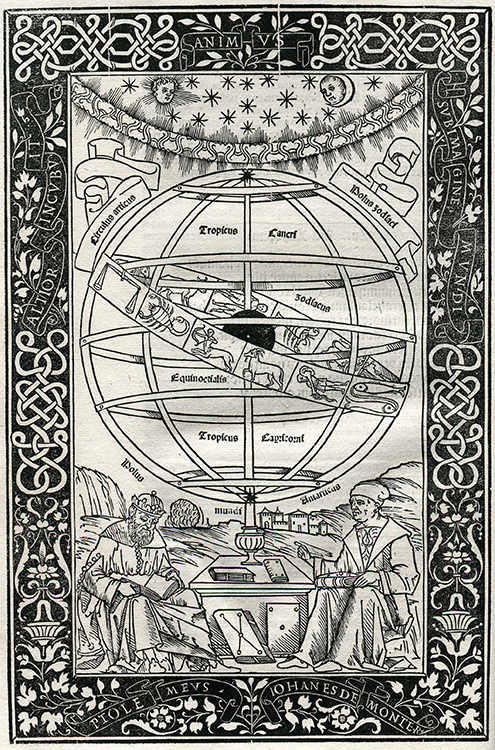 Abridgement of the Cosmographicus Liber, edited by Oronce Fine. Apian, Peter. 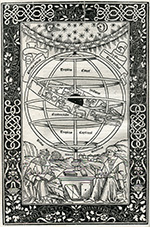 Cosmographicus Liber. Landshut: Johannes Weyssenburger, 1524. Astrolabii Canones. Venice: Paganinus de Pananinis, ca. 1497/8. Brahe, Tycho. Astronomiae Instauratae Mechanica. Nuremberg: L. Hulsius, 1602. Brahe, Tycho. De Mundi Aetherei Recentioribus Phaenomenis. Prague: Typis Schumanianis, 1603. Copernicus, Nicolaus. De Revolutionibus Orbium Coelestium. Nuremberg: J. Petreium, 1543. Copernicus, Nicolaus. De Revolutionibus Orbium Coelestium. Basel: Henricpetrina, 1566. Einstein, Albert, et al. Annalen der Physik. 4th series, Band 17. Leipzig: Verlag von Johann Ambrosius Barth, 1905. Estwood, John. Summa Astrologiae Judicialis. Venice: J.L. Santritter, 7 July 1489. Farraggine Astronomica. Manuscript on paper, 1641. Figueroa, Juan de. Opusculo de Astrologia. Lima, 1660. Fontenelle, Bernard le Bovier de. A Discourse of the Plurality of Worlds. Dublin: Printed by Andr. Crook and Sam. Helsham for William Norman, 1687. Guarini, Guarino. Caelestis Mathematicae Pars Prima [–Secunda]. Mediolani: Ex typ. L. Montiae, 1683. With: Guarini, Leges Temporum et Planetarum. . . . Augustae Taurinorum: Ex Typographia Haeredum Caroli Ianelli, 1678. Halley, Edmond. Tabulae Astronomicae. London: G. Innys, 1749. Heydon, Christopher. A Defence of Judiciall Astrologie. Cambridge: J. Legat, 1603. Hooke, Robert. Micrographia. London: Printed for John Martyn, 1667. Horrocks, Jeremiah. Opera Posthuma. London: Mosem Pitt, 1678. Hyginus. Poetica Astronomica. Venice: Erhard Ratdolt, 14 October 1482. Hyginus. Poetica Astronomica. Venice: T. de Blavis, 7 June 1488. Joannes de Sacro Bosco. Sphaera Mundi. Venice: Erhard Ratdolt, before 4 November 1485. Joannes de Sacro Bosco. Sphaera Mundi. Venice: Jacobus Pentius, 28 January 1500. Kepler, Johannes. Ad Vitellionem Paralipomena. Frankfurt: C. Marnium & Haeredes I. Aubrii, 1604. Kepler, Johannes. Astronomia Nova. Heidelberg: Gotthard Vögelin, 1609. Koebel, Jacob. Astrolabi Declaratio. Paris: H. de Marnef et G. Cavellat, 1585. Laplace, Pierre Simon de. Traité de mécanique céleste. Paris: Crapelet, 1798–1825. 5 v.
Le Fèvre d’Étaples, Jacques. Astronomici Theorici Corporum Cestium Libri. Paris, 1503. Manilius, Marcus. Astronomica. Nuremberg: J. Müller of Königsberg, ca. 1472. Newton, Isaac. Opera. London: J. Nichols, 1779–85. 5 v.
Newton, Isaac. Opticks. London: Printed for Saml. Smith and Benj. Walford, 1704. Newton, Isaac. Philosophiae Naturalis Principia Mathematica. 3rd ed. London, 1726. Oliver, Andrew. An Essay on Comets. Salem: S. Hall, 1772. Regiomontanus. Calendarium. Venice: Bernhard Maler (Pictor), Erhard Ratdolt, Peter Löslein, 1476. Regiomontanus. Epytoma in Almagestum Ptolemaei. Venice: J. Hamman, 31 August 1496. Schedel, Hartmann. Liber Chronicarum. Nuremberg: Anton Koberger, 12 July 1493. Two copies. Stöffler, Johann. Elucidatio Fabricae Ususque Astrolabii. Tübingen: T. Anshelm, 1514. Stöffler, Johann. Elucidatio Fabricae Ususque Astrolabii. Paris: H. de Marnef et G. Cavellat, 1585. Winthrop, John. Two Lectures on Comets. Boston: Green and Russell, 1759. Robert L. Volz is the former Custodian of the Chapin Library at Williams College.